One person it was nice to catch up with in Florence was Ann Ryley, who used to be sales and marketing director at Drake’s but left last year to help Scottish company Begg launch its first collection. Begg is an old name in Scottish weaving, growing up in the 1860s in Paisley and now based in Ayr. It is also one of the very best names, having always made scarves, stoles and blankets for some of the biggest luxury houses. 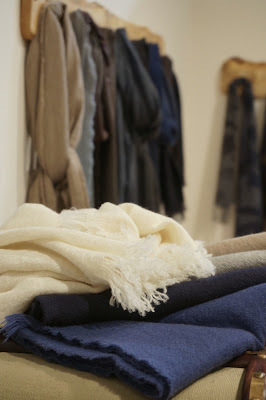 It is known for its ripple-finish scarves, which require the wool to be brushed with teasles – the dried heads of plants that are widely grown in Italy (see Loro Piana visit here). But it has a big range of other finishes, involving pressing in no-longer-made paper, beating the wool up in boxes and putting it through particular washes. 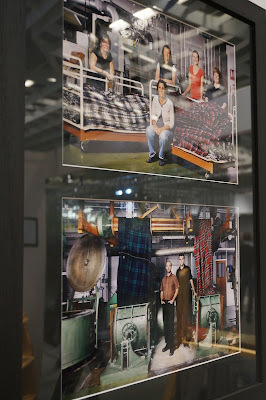 The old finishing machines are one of the finest things about the factory, and the Pitti stall proudly displayed pictures of them on the walls. Begg’s first range under its own name has been designed by Angela Belle for womenswear and Michael Drake for men’s. As Begg has always traditionally focused on womenswear, Michael was important to the launch, although looking around the collection there are only little touches of the old Drake’s aesthetic. There is a blackwatch tartan, for instance, but no gingham checks or paisleys. My favourite of the Begg scarves was a washed version you can see in cream at the top of this post. It gives the cashmere a spongy character and turns an otherwise fine, dressy cloth into something much more casual – better suited to the workwear side of the Pitti crowd. Begg is also publicising its Nuance scarf, which fades very subtly from one colour to another. This is rather less to my taste, though it does demonstrate Begg’s technical ability, as other fades are normally done with dip-dying and are therefore nowhere near as subtle. You can follow the discussion on Begg launches first collection at Pitti by entering your email address in the box below. You will then receive an email every time a new comment is added. These will also contain a link to a page where you can stop the alerts, and remove all of your related data from the site. Firstly, many thanks for the great blog. I wonder if I might foster some advice from you. I wish to purchase 2 suits which I will wear for work. My budget is £750-£1250 per suit. I am torn as to which way to go to get the best possible quality – both in terms of the fit and of the garmets themselves. I have previously purchased only off-the-peg suits and have favoured Aquascutum and Paul Smith as the cut/style of these has suited me best. – A local tailor offering bespoke (or possibly, “bespoke”), suits. I live in Cheshire and whilst I do travel to London, it’s on an every-so-often basis, so convenience in the process is a consideration, albeit a minor one. Your advice as to which of these options to go for, or whether in fact you would suggest something else, would be most gratefully received. I would certainly recommend Graham Browne over Cad & the Dandy. The latter are not tailors. It’s hard to know the quality of your local bespoke tailor, but I think it’s worth travelling to London if you can, and it ties in with other things. This is very good to know, would Graham Browne be your best ‘cheaper’ tailor recommendation? Do you know who will be stocking the Begg scarves? Very informational blog. I love to read this kind of stuff about fabrics and its origin. It gives me more ideas on how to select the best. Thanks! Anything Michael Drake does will be wonderful. A lovely man with marvellous ideas.